I had a conversation at the Farmer's Market today with a distinguished meteorologist whose explanation of the drought led me to conclude that it might be September before the weather pattern will change. The best we can do is try to cut our losses and just observe how various species respond to this onslaught. The lush green photo below was taken yesterday at the Barn Prairie, one of the wet-mesic prairies at Pleasant Valley Conservancy. The Silphiums, yellow cone flower, ironweed, mountain mint, and others are doing very well, which is understandable, since they are not suffering any drought at all. There is a broken tile field within 100 feet of this prairie that I use to monitor ground water and its water level has not even dropped an inch. In fact, the extensive springs and pools in this area have continued to flow through all the droughts we have had over the last 15 years. The savanna areas are quite variable, and how they have responded depends on the openness of the canopy. The photo below shows false solomon's seal (completely crisp) and carrion flower (lush green). 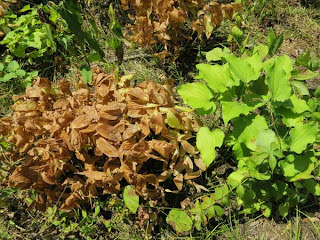 Woodland sunflower is also completely wilted, and woodland Joe Pye is starting to wilt. 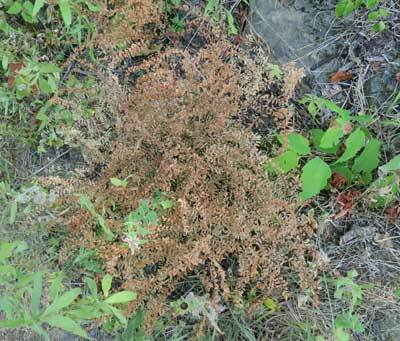 Woodland thistle will end up with stunted growth. The most severe areas are the south-facing slopes. However, prairie dropseed looks as lush and green as ever (photo below), whereas little bluestem is mostly crisp and dead. Obviously, dropseed has a deep root system. Finally, Black Earth Rettenmund Prairie is a disaster. 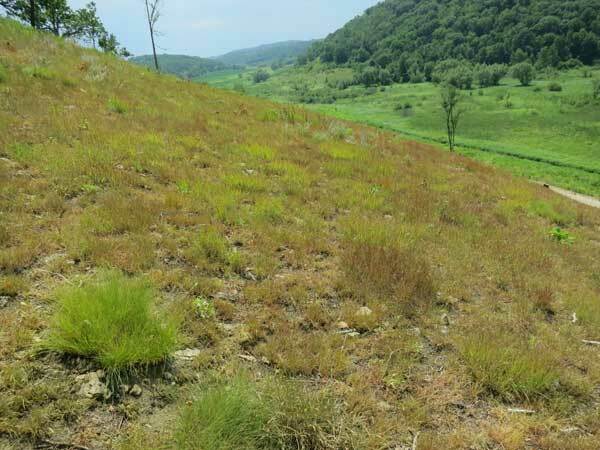 Just a few weeks ago this dry to dry-mesic prairie was a riot of color and now it looks really bad. 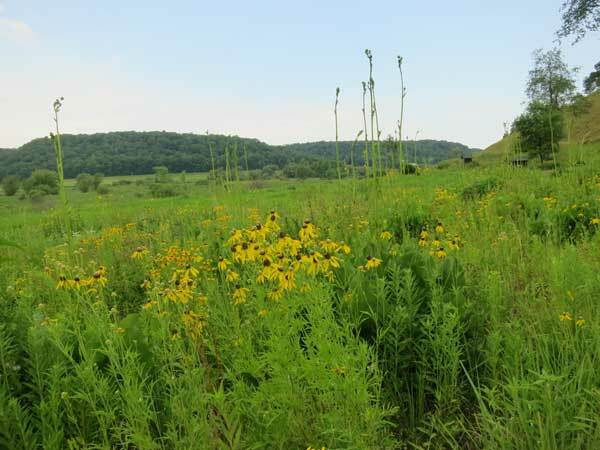 Only compass plant, one of the most deep-rooted species, remains in flower, and it is not certain how long it will continue to thrive. However, some patches of big bluestem were flowering. Anyone planning to collect seeds for a fall planting might as well forget it. It seems unlikely that any of the species flowering from mid-summer through fall will make any seeds at all. Seed companies that have irrigation should be able to make a killing this year!